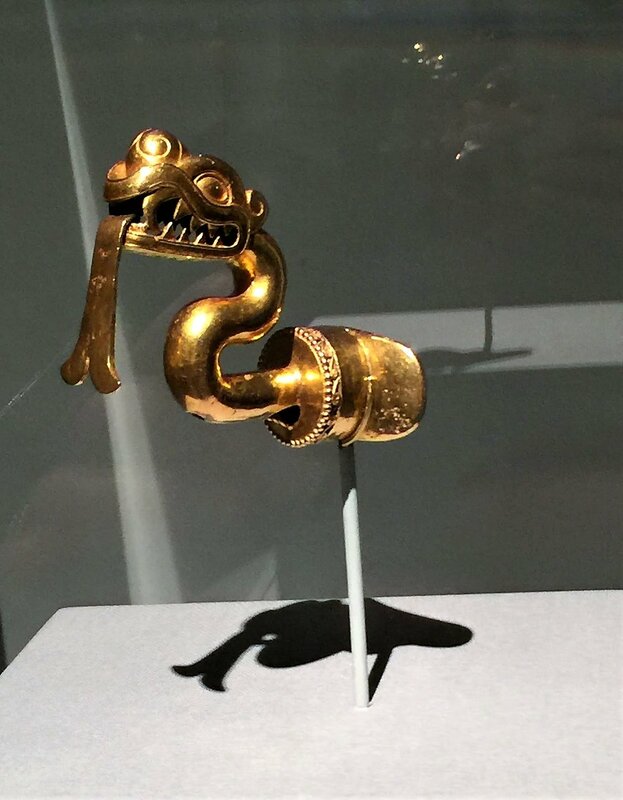 On view until May 28th, the “Golden Kingdom: Luxury and Legacy in the Ancient Americas” exhibit at the Metropolitan Museum of Art, features luxury arts of the Incas, the Aztecs and their predecessors. This object would have been affixed to a cylindrical headdress. Made of gold sheet, it was cut into the shape of a supernatural figure with serrated octopus tentacles that terminate in catfish heads. Gold is prominently featured of course but also jade, feathers, shells, malachite, obsidian, cinnabar… Ancient Americas civilizations did not put value on gold per se (it was called the excrement of the gods) but rather once it was shaped in a specific object. Spanish colons on the other hand, only saw value in the material and proceeded to melt every gold items they seized. As a result, few precious objects survived the Spanish conquest. The fact that this exhibit gathers over 200 of them makes it exceptional. It is interesting to note that several centuries later, contemporary jewelry too judges a piece for its artistic intent and craftsmanship rather than for the commercial value of the materials used. Made of at least 18 separate pieces of hammered gold. It covers the wearers mouth and much of the face. Nose rings and plates, earlobe enlargement rings (earflares), tongue jewelry, head pieces all feel strangely contemporary – or is it our current society drawing inspiration from preceding cultures? Crafted in the shape of a serpent ready to strike, this labret (lip plug) was ingeniously cast as two separate pieces, so that the moveable bifurcated tongue could be retracted or allowed to swing from side to side as the wearer moved. Highly prized by pre-Columbians civilization was jade. 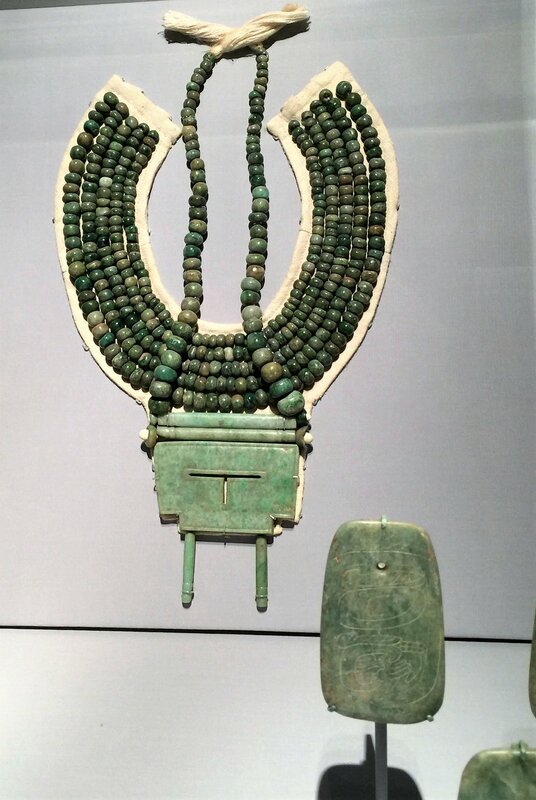 This massive jade pectoral and necklace were part of an assemblage discovered in a tomb at Calakmul. The large plaque is in the shape of the hieroglyphic logogram for ik', meaning "breath" or "wind". Women played a central role in conjuring deities.